provide exceptional nutrition and extraordinary flavor. Our recipes look, taste and smell so good because they're naturally that way. make more out of mealtime. A natural, homestyle stew with tender cuts in savory gravy. Venison Broth, Venison, Salmon, Beef Liver, Potatoes, Carrots, Egg Whites, Potato Starch, Natural Flavor, Guar Gum, Oat Fiber, Eggs, Apples, Sodium Phosphate, Potassium Chloride, Minerals (Iron Proteinate, Zinc Proteinate, Cobalt Proteinate, Copper Proteinate, Manganese Proteinate, Sodium Selenite, Potassium Iodide), Vitamins (Vitamin E Supplement, Vitamin A Supplement, Thiamine Mononitrate, Vitamin B-12 Supplement, Vitamin D-3 Supplement, Biotin, Riboflavin Supplement), Choline Chloride, Rosemary, Sage, Thyme. 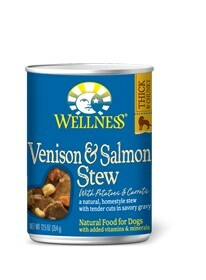 Wellness® Venison & Salmon Stew Dog Food is formulated to meet the nutritional levels established by the AAFCO Dog Food Nutrient Profiles for growth & maintenance.